WHY CLEAR AND CHARGE MY HEALING CRYSTAL? Clearing your healing crystal realigns its energy and charging it aligns it to your intentions. 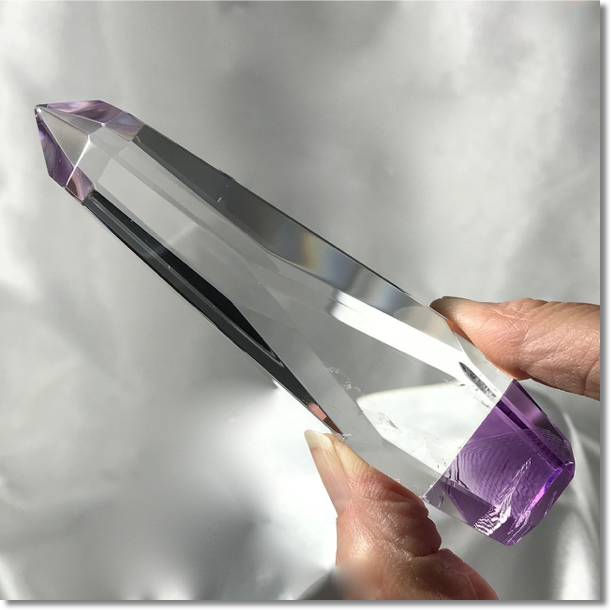 It's a simple and quick process that begins your healing crystal ritual and practice. The kind folks at Crystal Light and Sound throughly cleared your crystal before it was shipped to you. You’ll want to clear and charge it regularly, especially with daily use. We recommend that you charge your crystal with your personal, unique intentions so that it may serve you in the highest way possible. As you bring the essence of peace into your mind, fill yourself with this essence as you hold your crystal about 3-4 inches from your mouth. Focus your attention onto the crystal with the intention of clearing your crystal of all unwanted energies. Inhale deeply, filling your diaphragm and bringing in the essence of clarity and peace to your mind. Hold this breath for a second or two with focus on clarity. In a sudden, forced exhale, blow out the air from your lungs (Marcel Vogel recommended through the nostril but through your mouth works too). Holding your crystal, ask it if it is fully cleared. With a quiet mind, listen for the answer. Repeat this clearing method until you sense your crystal is cleared. You can also use dowsing to confirm the answer. You may need to repeat the clearing a few times, especially for new-to-you crystals. - “My intention is to release all stress and pressure inhibiting my well-being”. The sun can be used to purify and charge your crystal but only in short bursts. 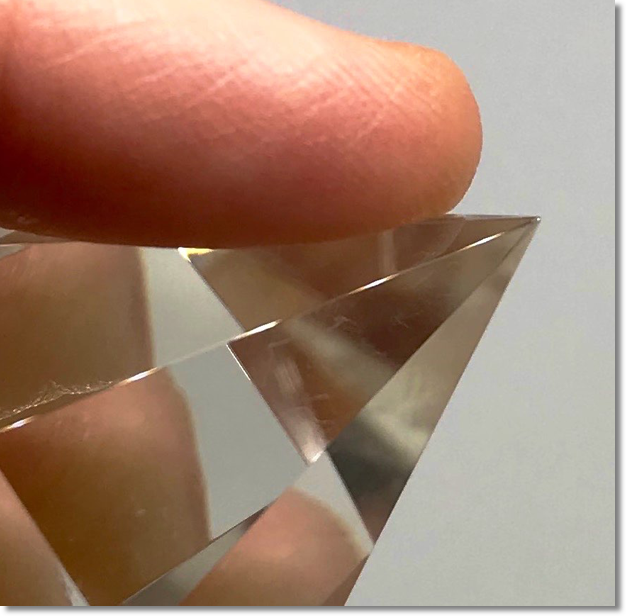 Long-term exposure to the sun can result in damage by causing fissures in the skin of the crystal. The moon can be used to charge the crystals, using light energy, by placing the crystal on a window sill during the phases of the moon. Clean your crystal by wiping it with dampened clean cloth. Never submerge your crystal in water for long periods of time. Never use salt or salt-based substance to clean your crystal. Marcel Vogel likened crystals to batteries. Salt discharges electronic devices. Store your crystal in a padded carrying case when not in use. Use your crystal regularly to keep it from going to sleep. PLEASE NOTE: CRYSTAL WAND POINTS ARE DELICATE! The points of finely cut crystal wands are extremely delicate (and sharp). The majority of damage to crystal wands typically occurs in the top 1/8” of the point. Please avoid any contact with the tip of the points, both male (transmitting) and female (receiving) ends. In the event of a break, a crystal wand can often be repaired. Repair costs start at $50. Please contact us for more information should you chip or crack or break your crystal. WAYS TO WORK WITH YOUR HEALING CRYSTAL? Using your crystal for energy healing and enhancement is a very personal practice. Each of us is on our own spiritual path, each of us will find different ways of practicing crystal energy healing to support our unique intentions and desires. Hold your healing crystal during meditation. Position a healing crystal on your yoga mat. Place your crystal next to your bed as you sleep. Place your crystal in a sacred place such as your home altar. Keep your crystal with you, in your pocket, pack, purse. Place your crystals on your body in chakra positions. Learn how crystals can take you deeper into your healing journey or energy healing practice.